Just outside of Cancun, Mexico.Most of the sunrises were cloudy. Cancun had the best sunrise so far. We would invariably miss most of the sunsets on the cruise. 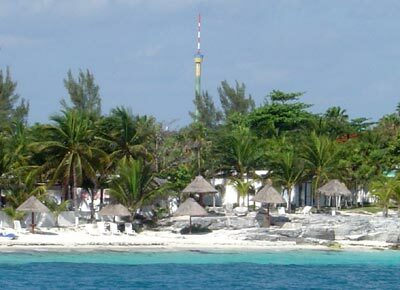 The city’s skyline made it clear that this was the most developed city on our stop.The water in Cancun was unreal! It had the strangest colors: deep blues, bright greens, aquamarine – just like the gem. It was crystal clear. You could easily see the bottom of the ocean in 40+ feet of water. 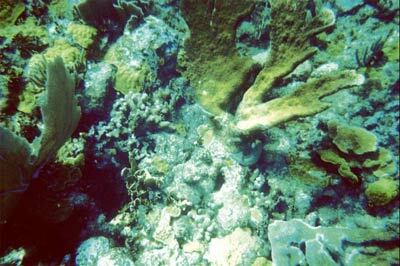 It was peppered with coral reefs, and the reefs invariably had fish and other life forms swimming around. This port was also a tender port. Our ship dropped anchor about 2 miles from the coast and we all hopped on a 500-passenger triple-decker tender boat and headed for the shore -at about 10 mph. Ugh. This thing moved so slow, I swear I could swim faster! 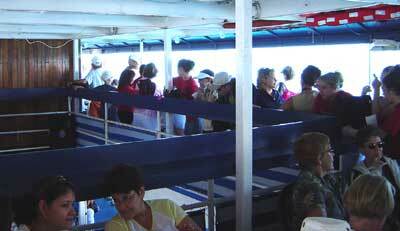 The Belize boat held fewer people, but moved along at a brisk clip. If you think car dealers have huge flags, check this out. This flag pole is probably 200′ tall. Note its size relative to the 10-story building.Nevermind the flagpole. Check out the water! 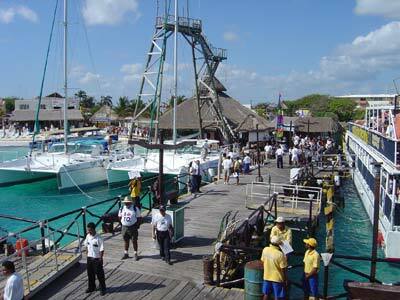 The dock at Cancun.We took an excursion to go snorkeling. As soon as we hopped off the tender boat, we got on a smaller (faster) boat and headed out to a spot about 1 mile past where the ship anchored. The water there was between 10 and 30 feet deep. We donned our snorkel gear and jumped in the water. Our excursion consisted of floating/swimming a little over an hour to cover a 1 mile stretch. There were about 20 people in our group. Here’s one piece of advice: get contacts. Kinda stinks trying to see underwater when you can’t wear your glasses. 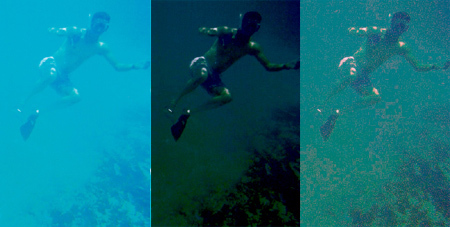 But it’s easier to see underwater w/o glasses than above water, so it was still quite the experience! 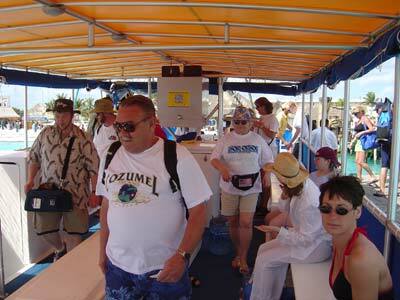 Everyone says Cozumel is better for snorkeling. I guess we didn’t go to the right place or something, because Cancun was much better. 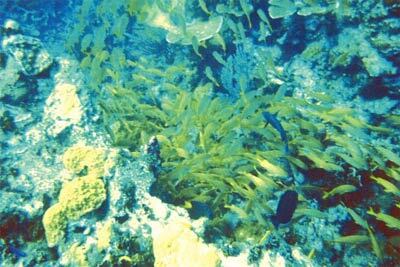 Here we go again with the disposable underwater camera. That piece of junk simply doesn’t do ANY justice!! 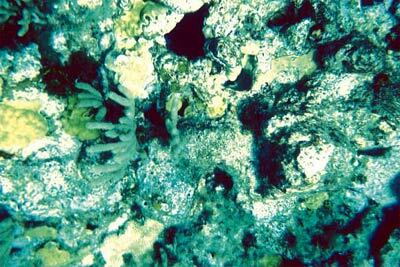 This is actually a bunch of *pretty* coral stuff about 10-15′ underwater. In this shot, I’m about 50 feet away from the rest of the people in our group. You can see their legs at the top of this photo – 50 ft away, mind you. 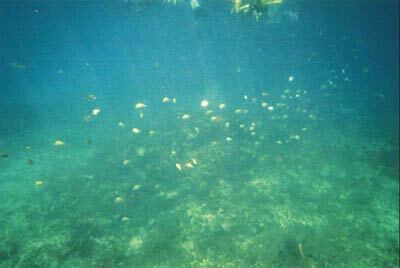 We’re swimming in about 15′ of water, with a bunch of fish swimming below us (the yellow dots). Didn’t see any sharks or rays. Have to go to other places to see/feed them. 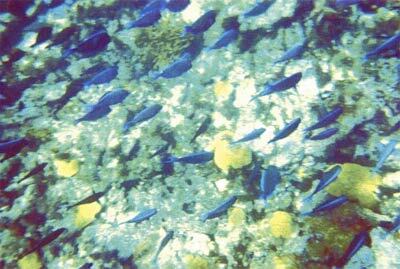 Bunch of yellow fish and some blue fish. They were about 8-14″ long. Trust me, it was really pretty. Seriously. Not all the fish were yellow and silver. Here’s some blue ones. I tried touching them a few times. Couldn’t get too close. I got chased out of a couple of these shops too. Some of the store owners were nice, tho. A ~12 yr old kid had a small table. “How much for the conch shell?” I asked.”$5, sir!” and proceeds to bag the item. “$5 for this too, sir, but for you.. $4”, and proceeds to bag the toy. And there’s one valuable tip I learned: Don’t haggle too much ..and if you do, be careful what you pick up. If something’s leaning against what you pick up and it falls over and breaks, you’re in the hot spot. I ended up buying a broken “$80” mask this way. “Si, si! This $80!” She looked like she might cry. I paid her $20 for it, and got the store owner (her son) to include a HUGE “quartz” diamond with it (the item I really wanted). It was $10 more than I wanted to spend, but I felt bad for her, so I figured $20 for both was fair game. I figure she pocketed $15 profit on that little deal. Sheryl just stared at me. Anyone want a broken mask? 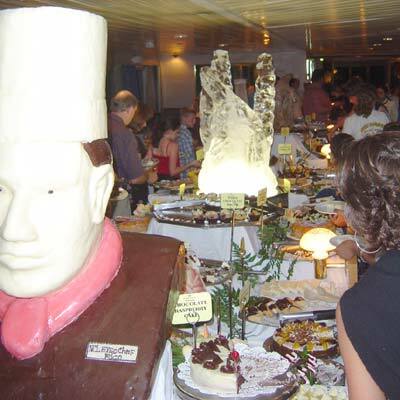 Thursday night at midnight is the “Chocolate Buffet”. Everything on this table is chocolate. Everything! (Even the chef’s bust). Ok.. the ice sculpture wasn’t chocolate, but still! This buffet table stretches all the way back to the white wall. And it’s only 1/2 of the layout. There was a 2nd set of tables on the other side of the restaurant. I had about 1/2 a plate, and I was done. I forget the magician’s name. 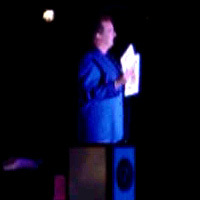 He had some pretty cool tricks that stupefied the audience. He called me and 2 other guys on the stage and linked our wedding rings. I’m not sure how he did that.